An attorney by training, Mr. Rivera applies his legal and political analyses to today’s most pressing issues with a well-respected thoughtful assertiveness. Geraldo Rivera joined Fox News Channel in November 2001 as a war correspondent. He is currently stationed in Afghanistan covering Operation Enduring Freedom. Rivera began his news career in 1970 when he joined New York’s WABC-TV as a reporter for Eyewitness News. In 1972, he presented a series of ten investigative reports exposing deplorable conditions at the Willowbrook State School for the Mentally Ill. This award-winning report led to a government investigation, court intervention and the subsequent closing of much of the institution. From 1974 – 1976 he hosted Good Night America on ABC (where he secured and presented the first television broadcast of the now-famous Abraham Zapruder film of the assassination of President John Kennedy), and later joined that network’s entertainment division reporting for Good Morning America. In 1978, he began what would become a seven-year association with the ABC Newsmagazine 20/20. (One of the stories he produced, The Elvis Cover-up, became 20/20′s highest rated segment ever). He then left ABC to form the Investigative News Group for the purpose of producing a series of live specials and in 1997, in association with Tribune Entertainment, produced his own talk show Geraldo. From 1991-1992, Rivera also hosted Now It Can Be Told, a nationally syndicated primetime investigative news show. After eleven successful seasons The Geraldo Rivera Show (as it was later renamed) had its final taping in May of 1998. 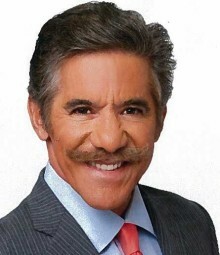 In 1994, Geraldo joined the NBC Cable Network, CNBC, and began his highly successful, issue-oriented, nightly talk show Rivera Live. The program focused on the latest developments in legal issues and court cases around the country, featuring interviews with many of the nation’s brightest defense attorneys, prosecutors and judges. On February 4, 1997, Rivera’s critically acclaimed coverage of the O.J. Simpson civil trial verdict set an all-time CNBC ratings record of 5.9, with won than 3 million viewers tuning in. In 1998, his second show on CNBC Upfront Tonight, made its debut. As co-anchor of Upfront Tonight Geraldo and Diane Dimond peeled back the day’s top headlines to reveal truths and emotions that are hard to ignore. Since the start of his news career, Rivera has covered seven wars, conducted exclusive interviews with the likes of Fidel Castro and Charles Manson, authored more than five books, and received more than 170 awards for his work in television journalism. These include the prestigious George Foster Peabody Award, three national and seven local Emmys, two Robert F, Kennedy, two Columbia-Duponts, and two Scripps Howard Journalism Awards. He has received three Honorary Doctorate Degrees. Since 1987, Rivera has been the honorary chairperson for the Working Organization for Retarded Children and Adults annual Geraldo Rivera Golf and Tennis Classics. The proceeds from this event go towards building homes for mentally and developmentally challenged people. In 1990, he founded the Maravilla Foundation; a non-profit organization dedicated to equal opportunity education and “adopted” a class of junior high school students. Rivera promised to subsidize their college education contingent upon completion of high school and at this time is helping support seven students who are in various stages of college. Rivera also sponsors five children through the Save The Children Foundation. Do you want to hire Geraldo Rivera? Directly request a quote. In 48 hours we can send you the availability of Geraldo Rivera If you would like to book Geraldo Rivera, Entertainment Booking Agency is the right place. We will offer you the best price and contact the management or we directly contact Geraldo Rivera. For corporate appearances or speaking engagements you can contact our agents and the will help you true the process. Tags: hire Geraldo Rivera, Geraldo Rivera booking, book Geraldo Rivera, Geraldo Rivera appearances, find more information on booking Geraldo Rivera for appearances, Geraldo Rivera speaking engagements, Geraldo Rivera endorsements/spokesperson, Geraldo Rivera appearance fees, Geraldo Rivera booking agency contact info, biography of Geraldo Rivera, Contact an artist booking talent agent find a speakers bureau that can book Geraldo Rivera, speaker booking agency for Geraldo Rivera, Geraldo Rivera booking agency, Geraldo Rivera booking for corporate event. EBA is one of the biggest entertainment booking agencies in the World. We book hundreds of celebrities, artist, athletes and speakers in a year. Important to know is that we are not claiming to be the management of Geraldo Rivera. We are not the official agent for Geraldo Rivera. Companies from around the globe book these artists and speakers true our company be course we have one of the biggest networks and we always have direct contact with the artist or the management. We help you to find the right celebrities for your corporate of private events. Please contact one of our agents to get free advice and we will help to get the world-famous artist on your party.